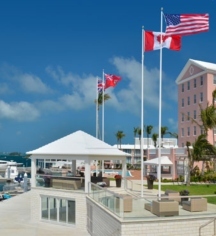 The Hamilton Princess & Beach Club opened on January 1, 1885, in Bermuda, just following the island’s rise to prominence after a visit by Princess Louise, the fourth daughter of Queen Victoria of England. On the tails of this rise to prominence, businessman Harley Trott, head of Trott & Cox steamships, dreamed of a seaside resort destination that would attract American tourists and compete with the likes of Palm Beach. Having referred to the island as “a place of eternal spring,” Princess Louise was the inspiration behind the name of the hotel, which was originally named The Princess. With long, shady verandas, a blue slate roof, and four stories of 70 guestrooms, the hotel was considered a gem on the island. It was extremely luxurious, boasting amenities such as gas lights, hot and cold running water, and five-inch mirrors, which were not commonplace at the time. During its early years, the hotel made a name for itself with upper-class socialites living on the island, as well as wealthy leisure travelers, political figures, and businessmen. 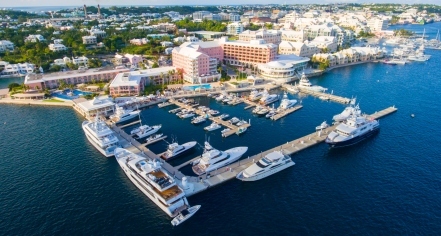 When Thomas Cook Tours started offering voyages to Bermuda from New York, the hotel staff, dressed in white jackets, would wave pink handkerchiefs as they greeted guests from the luxury cruise liners. Celebrities began to visit the hotel as it gained popularity; Mark Twain was a regular and would smoke cigars outdoors while signing autographs and reciting poetry. The author of the James Bond novels, Ian Fleming, was so impressed by the hotel that he included it as a location in his novel, Dr. No. During World War II, the hotel acted as a British intelligence center and way station that intercepted and analyzed all mail, radio, and telegraphs bound for Europe and the Americas. After the war, air travel to Bermuda increased, and the island became a prime destination for American families looking to escape for short-term holidays. To appeal to the influx of American family travelers, the hotel rebranded itself, becoming The Princess Hotel and The Cottage Colony. In 1959, American tanker billionaire Daniel Ludwig purchased the hotel and renovated it to increase the level of prestige, adding a new wing and luxurious lounges, while the cottage colony was levelled. Now, over a century later, Hamilton Princess & Beach Club is the Grande Dame of the island and the oldest hotel of the Fairmont Hotels & Resorts family. Hamilton Princess & Beach Club, A Fairmont Managed Hotel, a member of Historic Hotels Worldwide since 2018, dates back to 1885.